“You’ve been left at home in charge of the laundry. It’s already washed and hanging out to dry on the line. But you were warned – on pain of death – to bring it in if it starts to rain. The trouble is, you’re totally into whatever it is you’re coding right now and you won’t even notice if it rains. You’ll be toast if it rains and the laundry gets wet. So which is it to be? Code or laundry? That was your choice – until now! 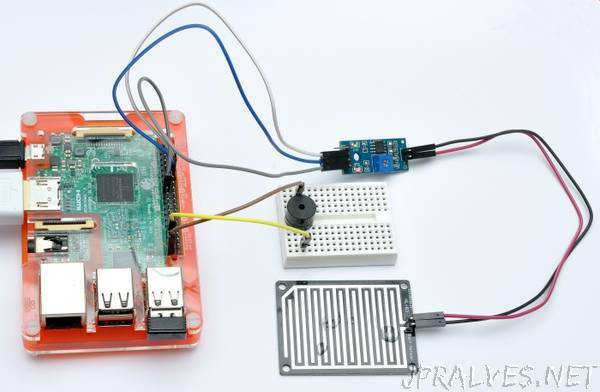 We’re going to use a simple raindrop sensor, a buzzer and a Pi to alert you when it rains. So you can get on with something useful instead of watching the weather. The components can all be found in a little kit on the RasPiO online shop. You could also use an Arduino or Wemos, but a Pi will let us use GPIO Zero with Python and will be easier to extend later if we want to take it further (e.g. sending tweets etc. ).